Growing businesses experience many challenges—solving them often requires unique solutions. Enterprise Consulting will help you take your business to the next level. FP Transitions is proud to partner with the FPA to support the Power of Planning and the Next Generation of Financial Advisors. Assess your current value and position as a foundation for achieving growth. Whether your business goals include increasing value, recruiting new talent, selling your business, or building a legacy, FP Transitions has the tools and experts to help you get there. Ensuring a successful acquisition or sale is a matter of details. 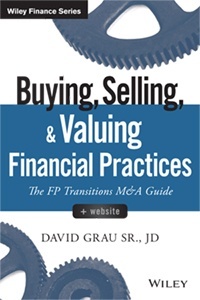 Buying, Selling, & Valuing Financial Practices, the latest book from FP Transitions president and founder, is a master guide to buying, selling, and merging financial services businesses. Tapping into almost two decades of experience in the financial industry’s M&A marketplace, this book provides in depth information and strategic guidance to prepare both buyer and seller for a smooth sale that ensures both walk away with the best possible terms. Buying, Selling, & Valuing Financial Practices will ensure that the M&A transaction is properly and professionally executed for an outcome where everyone wins—buyer, seller, and clients. Also available: Our first book, Succession Planning for Financial Advisors.